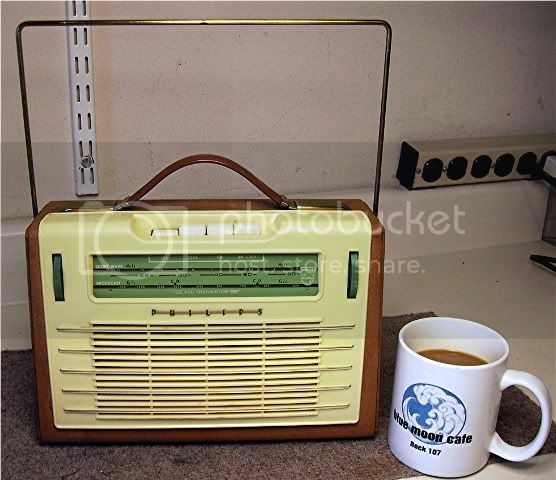 Here's a spot to post pictures of your transistor portable radio collections and new finds. Here is most of my collection. I excluded cheap 60s/70s multiband sets. I also have doubles triples and quadruples of many of these sets. Left to right then center. All these sets perform beautifully. The Trans Oceanics have all been thoroughly cleaned and completely aligned starting with the IFs. The only sets I haven't aligned because I see no reason are the Panasonic RF-2200 and Sony CRF-5100. All these sets are with 90% or better condition. I hate using the term "mint" because that infers they're the same as when new. I don't buy it with 20-40 year old sets. Performance wise, these sets are very close to one another. The best is hardly above the worst in sensitivity. The main difference I find is image rejection and selectivity. Here they are in order with these parameters in mind. Zenith Trans Oceanic D7000Y & Panasonic RF-5000A(the Panasonic loses to the Zenith in image rejection, other than that they're equals in every way). Zenith Royal 3000-1, Zenith Royal 1000D, Norelco/Philips L5W34T are just about equal in every way. If anything the 3000 T/O seems to have an ever so slight edge in SW reception. Being I have several sets each of the 1000D & 3000 it's an honest comparison. Not sure why but if you like to nit pick sensitivity, that's my finding. Sound quality in order best to worst;Sound quality for the various sets are close. Some sound better on FM than others but not AM. This is based on overall sound performance. Now this is probably the most debatable category of them all. I've had all these sets apart at one time or another. Plus I have parts sets for all these radios so I feel I know them fairly well. All sets show generally good to excellent build quality given their intended use & price range when new. But, there are known issues with many to watch out for. RF-5000A all T/Os SHARP FV-1710 and the CRF-5100 I would rate equal in build quality. The RF-2200, Norelco/Philips & ICF-5900W seem about the same in build quality. They are a step below the other sets. Sony CRF-5100 have issues with the band scale drum warping, WATCH OUT FOR THIS! It's not always evident so if you purchase one ASK ABOUT THIS. You may find yourself disappointed. I've taken the time to contact Sony of Japan for replacements and they're not available. I also find many of the Epay sets seem to lack the original antenna. Note my pick is the original antenna for reference. Parts sets aren't common and when they do pop up on Epay they usually go for $70+ dollars. Zenith 7000 series sets really have very few issues. Other than switch cleaning there are none to mention. 1000 & 3000 series sets suffer pitting and bubbling chrome. Also the brushed face cover pits badly. The carry handle is also the antenna and 5 out of 10 can be found cracked. Keep this in mind when shopping for one. The Panasonic RF-2200 suffers dirty switches in a big way. I seem to find them needing a serious cleaning more so than the Zeniths. Also watch out for a broken rotating ferrite rod antenna. What breaks on these is the detent socket/ball that holds them up. Also ask about dial backlash. These sets use delicate plastic gears to rotate both the dial & dial scale/scroll. If the dial knob is damaged or turned past it's stop, damaged gears could be the result. This makes accurate tuning difficult. Sony ICF-5900W. Similar to the RF-2200. Broken pop-up antenna, dirty switches. Also the battery cover seems to come up missing more often than not. If you are looking to purchase one, make sure you ask the seller. The dial system also suffers the same issues as the 2200, WATCH FOR THIS! No known issues with the Norelco/Philips but I've been told the dial strings in most Norelco's are a Bear to deal with if broken. Worse than many of our beloved tube sets. No noted issues with the SHARP sets. There are various models similar to the one I own. 1)Sony ICF-5900W - Very easy to handle, light, easy acquisition of operating controls. I've found I can get on freq FAST with this set. Easy to hold with one hand. 3)Sony ICF-5100 all Zenith T/Os & the SHARP - Easy to use but heavy making portability less desirable. Well that's all from me. I would like to see other multiband sets and any info associated with them from other members. Also any experiences counter to my own. Please post'em. Last edited by BDM on Jun Wed 28, 2006 5:08 pm, edited 2 times in total. Great post Brian, I'll have to get busy and round up some sets for a shot. I've posted 3 pictures of some of my collection to the gallery entitled "transistor collection 1, 2, 3. I haven't yet figured out how to post pictures into the Forum window. (edit by moderator) Here they are! That's all there is to it. Do that for each one and then "post". Your pics should come up. To satisfy my thirst for older and unusual multiband portables, I sometimes bottom feed on ebay when I notice a radio of interest is receiving few or no bids. This Philips L3X78T was begging for a bid shortly before the auction ended. While it has a ferrite loopstick antenna for the BC band, it uses a single flip-up rectangular loop for the 5 - 12 mhz shortwave band. Its handwired chassis is meticulously constructed and performance is very good for a radio that is stamped with a 7-Jan-1959 build date. I've updated my collection post with the Sony ICF-5900W including a pic. I've also added an ergonomics post towards the bottom of the original post. Here are some baby T/O wanna-be's that haven't left the nursery yet. 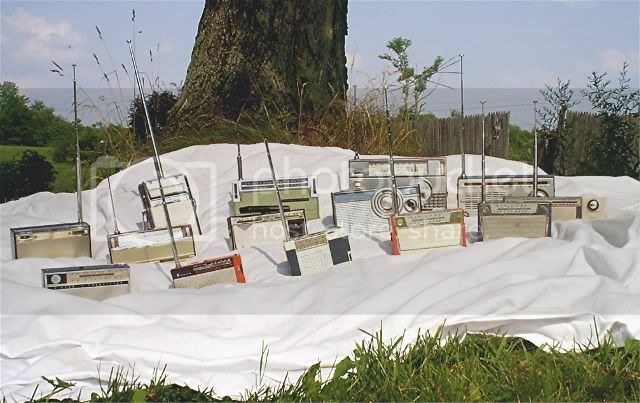 When Japan imposed an export quota limiting the number of AM transistor radios that could be shipped to the US, companies countered by selling these mini-multibanders which didn't have restrictions. Can you identify the one American-made set hiding among them? Recent additions to the collection are a Panasonic RF-1600, a Panasonic RF-2200 and a Philips (model unknown). The RF-1600 was a $10 purchase at this Fall's AWA flea market in Rochester. Although it's a little rough, it has taken up residence in my kitchen because of it's stainless steel look and good performance. It has continuous coverage in three bands from .530 to 18 mhz and from 87 to 174 mhz also in three bands. Audio performance is quite impressive. The RF-2200 was an ebay purchase during a weak moment. It is in "like new" condition and lives up to the fine performance that others have claimed. The Philips was a recent purchase from an ARF member who advertised it in the Classified section for $15. It came complete but in pieces. It cleaned up well and works great. It covers LW, BC, SW (49 - 19 meters) and (US) FM. The FM dial is on top. Dave, that looks like my Norelco L5W34T. Yours might be the same except it has the Philips name plate. Look at my pic above. Nice performer BTW. Sure looks the same. There are two paper labels (one on the battery cover and the other inside the radio) that had the model number but they are unreadable. What is the green light for? It flashes on briefly when I push the dial light button. Dial lights stay when the button is held down but the green light immediately goes out. Not sure? Mine does that. Last edited by Zenithman2003 on Aug Sun 10, 2008 11:21 pm, edited 1 time in total. Very nice, high quality collection! You display your sets on your website magnificently. Do you have any other transistor radios besides the three T/O's?